Our Mission is to focus on the potential for peace and environmental harmony on our planet, by carrying out climbs or treks, each one a pilgrimage to watch for the Earth; bringing together heart messages from thousands of individuals, making a difference both at an individual and a collective level. Our patrons are His Holiness the Dalai Lama, Joanna Lumley OBE, Doug Scott CBE, Princess Helena Moutafian MBE, Uri Geller and Ivy Smith, all of whom are passionate about peace on our Earth. Climb For Tibet gathers Peace Messages to speak out periodically from high places. This is in the manner of the long-held Tibetan tradition of Peace Messages on prayer flags flown from the highest places possible to blow in the winds, carrying prayers, hopes and wishes for the creation of a peaceful Earth. Please add your Peace Message here. Over the last two decades Climb For Tibet has also raised charity funds of over £150,000 for educational, environmental and compassionate projects. The main focus has been to build much needed schools in Tibet. We are delighted that 6 schools were funded for under-privileged rural children who without help would have had no opportunity to learn to read and write… (100% of money donated goes to the projects -no admin. fees etc. are charged by us). * July 1998 – Chimborazo (6310 metres) Ecuador, in the Andes – the highest mountain in the world measured from the centre of the Earth. * January 2000 – Aucanquilcha (6176 metres) Chile, in the Andes – the mountain closest to the sun at the turn of the Millennium. * Summer 2001 – Tibetan Peace garden in London and then from special mountain sites in the Tibetan Himalayas 1) Kailas – a mountain highly sacred to many faiths which, it is said, amplifies prayer and is the place to plant deepest wishes for the Earth to effect their manifestation. 2) Shishapangma – the highest mountain completely in Tibet. 3) Everest – the world’s highest mountain above sea level. * Summer 2003 – Mauna Kea (4205 metres), Hawai’i, in the Pacific – the tallest mountain in the world, measured from its base on the ocean floor. * May 2005 – Finisterra, the end of the Camino de Santiago de Compostella. * September 2017 - Across the Himalayas, via the Karnali River, Nepal, into Tibet and the kora of Mt Kailas. *September 2018 - Mount Olympus, Greece - legendary home of the Gods! I am dedicated to the pursuit of World Peace and the healing of the Earth. I passionately believe that we are making a difference by collecting thousands of Pledges for the Environment and Messages of Peace to carry to the far corners of our planet. This is in the long-held tradition of Himalayan prayer flags which are flown high to help bring peace and harmony to all beings. I have been featured in the national press as a 50 yr old living the life of a 20 yr old. 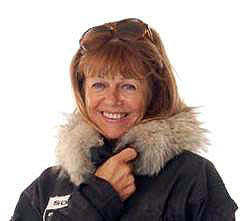 Now in my 60s and blessed with four beautiful grandchildren, my claim to fame is as the first and only grandmother to race to the South Pole! I am dedicated to the work of speaking out Pledges for the Environment and Peace Messages (sent from all over the world) at high and extreme places and raising money to build schools for under privileged children in Asia and other charitable projects. I am now 70 years old but still rock climb, ski, run, cycle and mountain walk/climb. Many of these pastimes are carried out with one or more of my four children, Claire, Graeme,Caroline and Anna plus my partner Jane. My business life was as an Insurance manager latterly running a large team. Now retired, I still occasionally instruct climbing and mountaineering and continue to enjoy the beautiful UK and Alpine mountain environment. 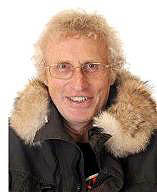 I have in the past climbed in the Himalayas, Andes and summited most 4000 metre peaks in the Alps. Apart from the mountain scene I have been lucky enough to have cycled from Lands End to John O Groats, run several marathons, run 7x 80 mile South Downs Way challenges and walked across Scotland from west to east twice climbing various Munros along the way. The various Climb for Tibet challenges completed with Tess are noted above. Currently I am recovering from a broken leg. 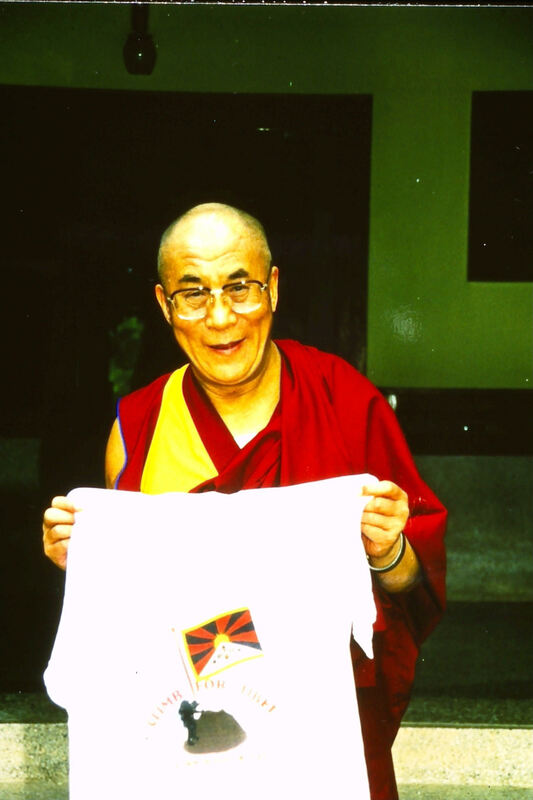 When healed I intend to undertake a new challenge to once again raise awareness of the plight of the Tibetans.